Toy Fox Terrier Dogs - The Toy Fox Terrier is a small breed of terrier dog, directly descended from the larger Fox Terrier but considered a separate breed. Toy Fox Terriers adapt well to apartment life. They are active indoors and will do without a yard, as they can usually take care of their own exercise needs. They often have trouble tolerating cold weather without careful acclimation. Their life expectancy is about fifteen years (since the breed has only been officially recognized by groups like the UKC and the AKC since 2000, there is little official documentation). Toy Fox Terriers are significantly healthful and resilient, however, as with many toy breeds, some are prone to patellar luxation (slipped stifle). Legg-CalvÃ©-Perthes syndrome and von Willebrand's disease are uncommon. Some dogs are allergic to beet pulp, corn, and wheat. The Toy Fox Terrier is easy to groom, although grooming is generally seen as unneeded due to how short the hairs are (under a centimetre in length most of the time). Sometimes, it is necessary to comb and brush the coat. It is a light shedder. This information is licensed under the GNU Free Documentation License. It uses material from the Toy Fox Terrier article on Wikipedia.org. 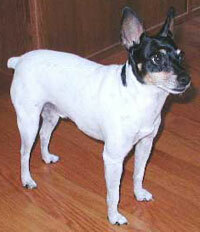 Toy Fox Terrier Breeders - Advertise your kennel puppies and dogs here. Foxytoy Toy Fox Terriers - Missouri - Beautiful Toy Fox Terriers, AKC and UKC pups, home raised and exceptional bloodlines. Oakwood Kennel - Texas - Family kennel and farm with a long family history of breeding and raising Toy Fox Terriers.